Each year my best friend Jen and I make plans to head out to the Ventura County Fair. We check out the entertainment offerings; take a spin on the wheel of random, and usually end up seeing a band that had their heyday in the 70’s or 80’s. This year the wheel stopped at Huey Lewis and the News. The last time we saw Huey was at this very same fair. I remember standing in a beer line and being told by some random dude that “Huey Lewis is the most esoteric band around”. Not only was he blatantly drunk, he was blatantly wrong. Huey Lewis’ music transcends the ages. After all, they play good time Rock ‘n’ Roll with a smattering of Doo Wop sensibility. And who doesn’t dig that?! Right out of the gate the pounding Heartbeat through the sound system signaled “The Heart of Rock ‘n’ Roll”, and let me tell you, it’s still beating. The crowd sang along and let their voices be heard, as “Heart” led into a couple of the bands biggest hits: “If This Is It” followed by “I Want a New Drug”. 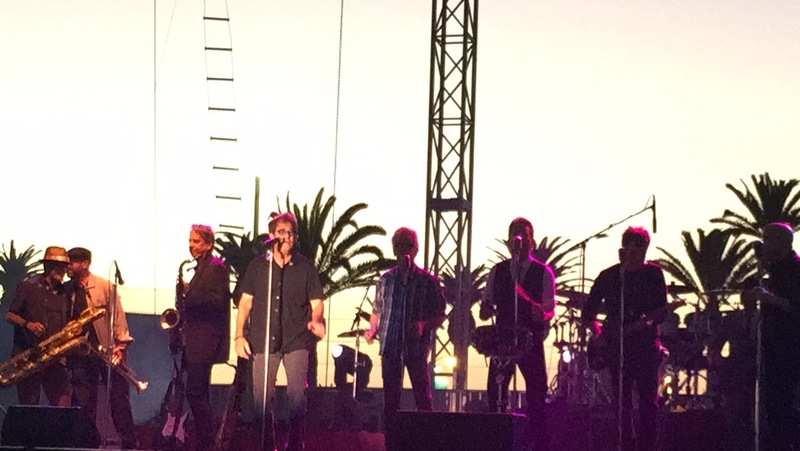 If you’ve ever been to one of Huey’s shows, you’ll know that he couldn’t do it alone and “The News” are just as important to that Huey Lewis groove. Not just happy with being talented musicians, they are also a group of accomplished singers; no more noticeable than on the 2 a cappella songs that spotlighted their signature harmonies, “Uh Huh” and the Bobby Day song, “Little Bitty Pretty One”. To show that this band isn’t resting on their laurels, they also threw out a few new songs. First up was “Her Love is Killing Me” and later for “those of us who are getting a little older, but aren’t done yet”, they sang “While We’re Older”. Very apropos for the 65 year old singer who still sounds and looks great! Although receptive, the Fair crowd wanted what they came for… the Hits… and they got ‘em… “Jacobs Ladder”, “Hip to be Square” and “Heart & Soul” finished off the main set. After a short break, the band returned and brought us Back to the Future with the “Power of Love”. That was followed by the Supercharge cover, and the band’s first hit, “Do You Believe in Love?”. The band ended the night with “Working for a Living” and as long as they keep entertaining the masses like they did last night… Huey and the News will have plenty of work, for a long time to come.